It all started with a trip to Berlin back in January 2018 when I was invited to attend the launch party for a prototype beer. A collaboration between Braukraft Munich and Pirate Brew Berlin, this beer was going to be the first of its kind in so many interesting ways. Despite not wanting to take on any new projects at the time, I was in the end convinced that a beer of this caliber should have the packaging it deserves, it should look as good as it tastes... and it tastes very good! 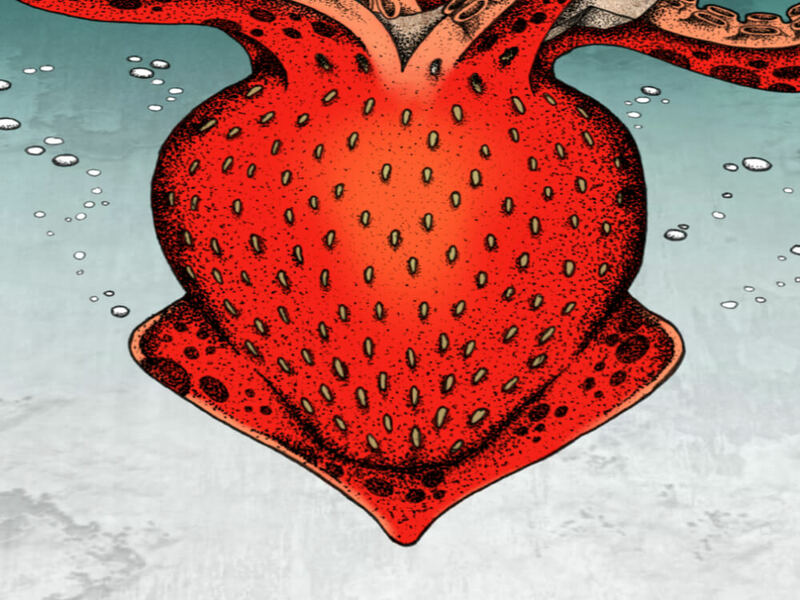 Beer profile: strawberry, red, fresh, peppers, vibrant, bright, surprising. Braukraft: industrial, gear, cogwheel, machine, grunge. Pirate Brew: sea, water, splashes, waves, ship, legends, Caribbean. 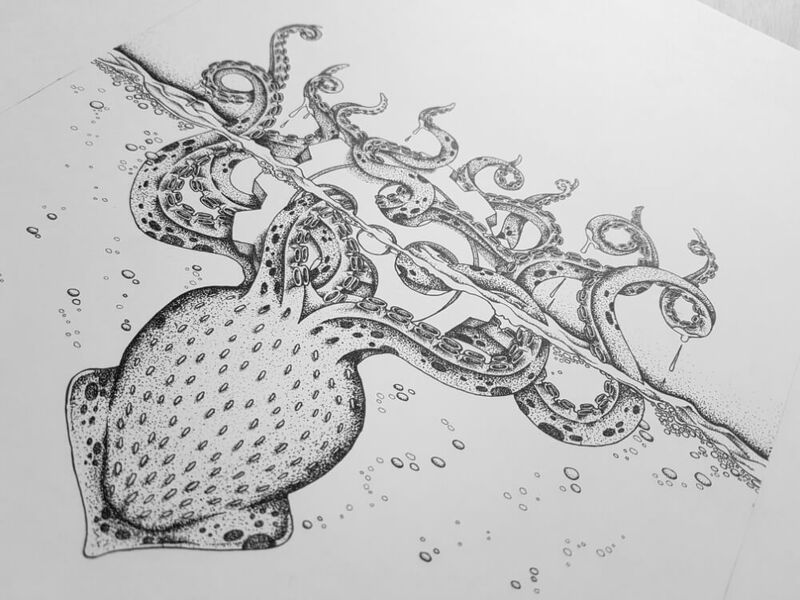 With these word groups as initial inspiration, I gradually built a concept that would bring it all together: a Kraken attacking a cogwheel in splashing waters! 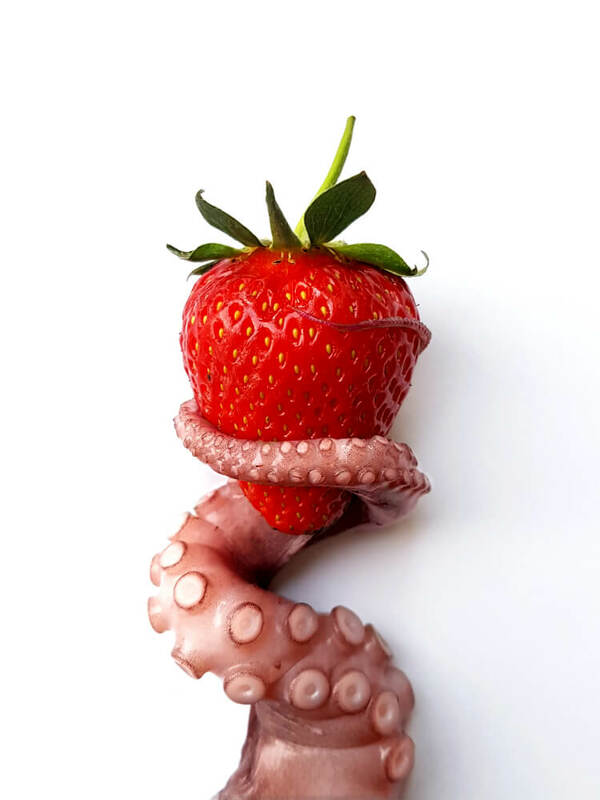 The idea was very appealing at first but it still needed to somehow include the strawberry. 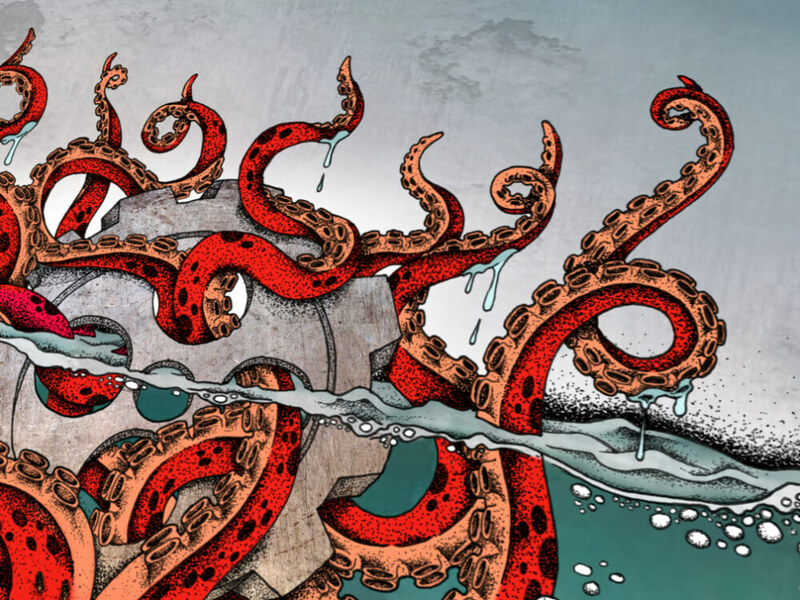 On top of that the Kraken itself was said to dwell off the coasts of Norway and Greenland, and not so much in the warm waters of the Caribbean seas where pirates once roamed. 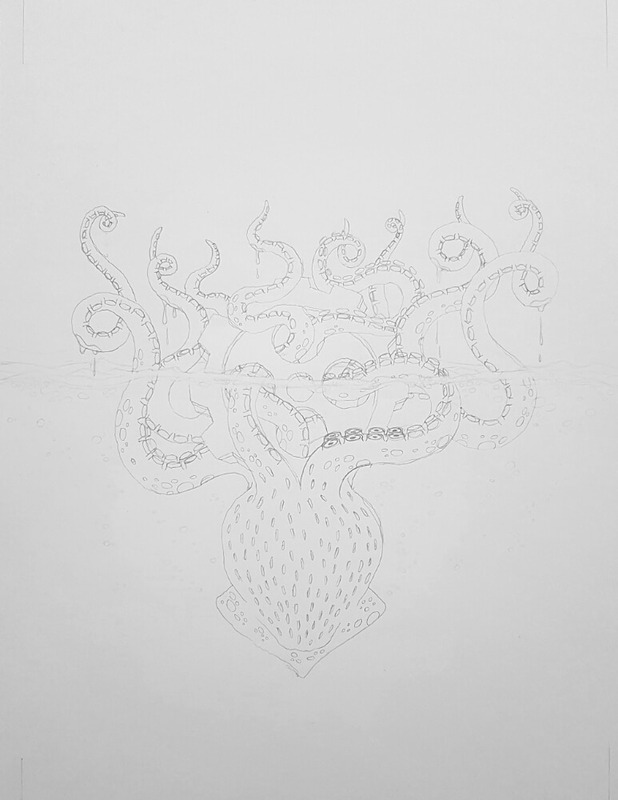 This was still a good starting point because even if the Kraken concept was done so many times before, I still felt like I could have a slightly different approach to it that would give it the uniqueness this beer deserves. 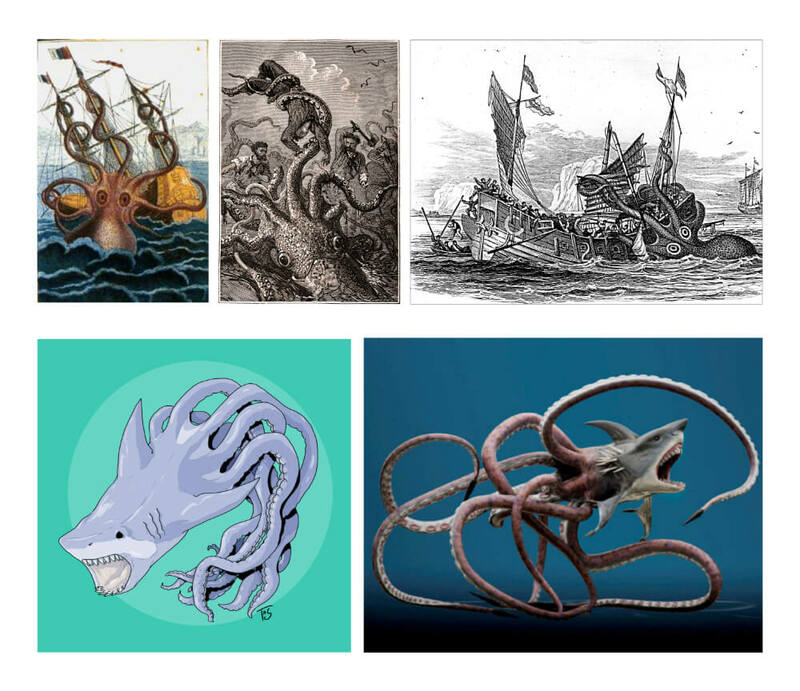 After extensive research I found my inspiration in the “Lusca”, a legendary sea monster said to have its layer deep within the abyssal blue holes of the Caribbean seas, praying on those pirate ships that have the misfortune of crossing its path. 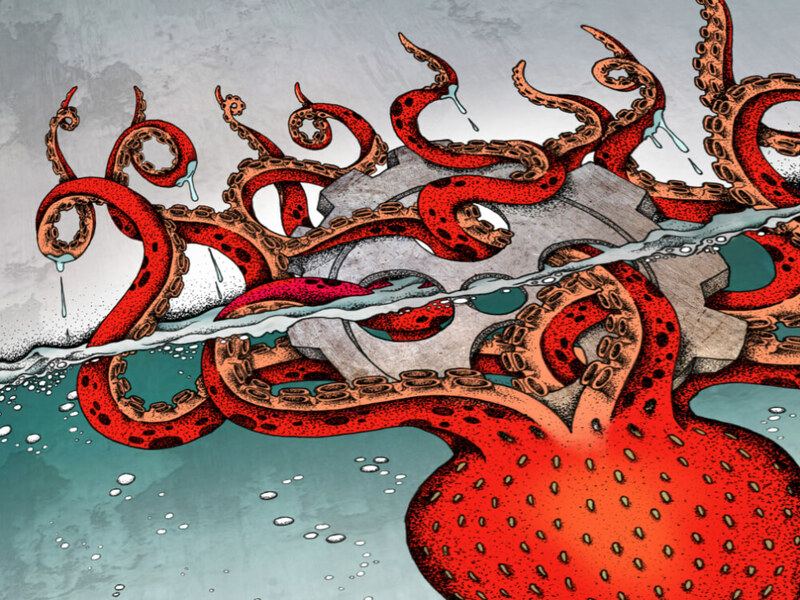 Some legends say that the “Lusca” is half octopus, half something else, while others say it’s more of an evil spirit, but one thing is for certain: the beast is said to be as colossal as it is fierce. 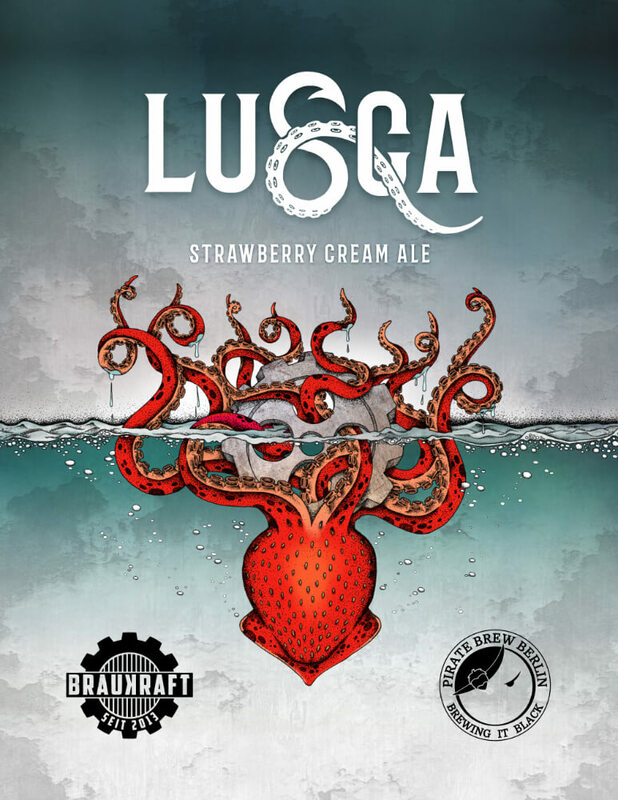 All of this made the “Lusca” an ideal candidate for naming the beer after and overall a great story on which I could base my design: a half octopus, half strawberry sea monster attacking a cogwheel from deep within clear tropical waters. 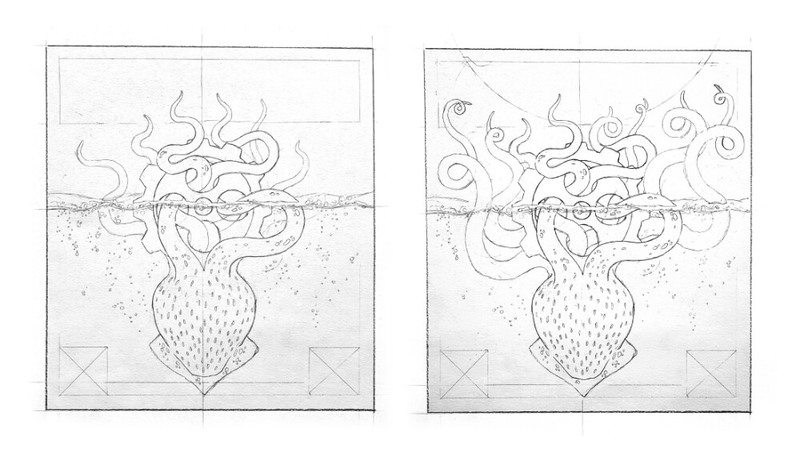 As with all of my beer label designs to date, I set myself the challenge of working with new materials that I haven’t illustrated before, which in this case were the tentacles, water, splashes and drips. Before getting too carried away though, I first sketched up my idea in pencil and validated it with the two brewmasters leading this project, Kirsten Rhein of Braukraft Munich and Cristina Sáez Martínez of Pirate Brew Berlin. 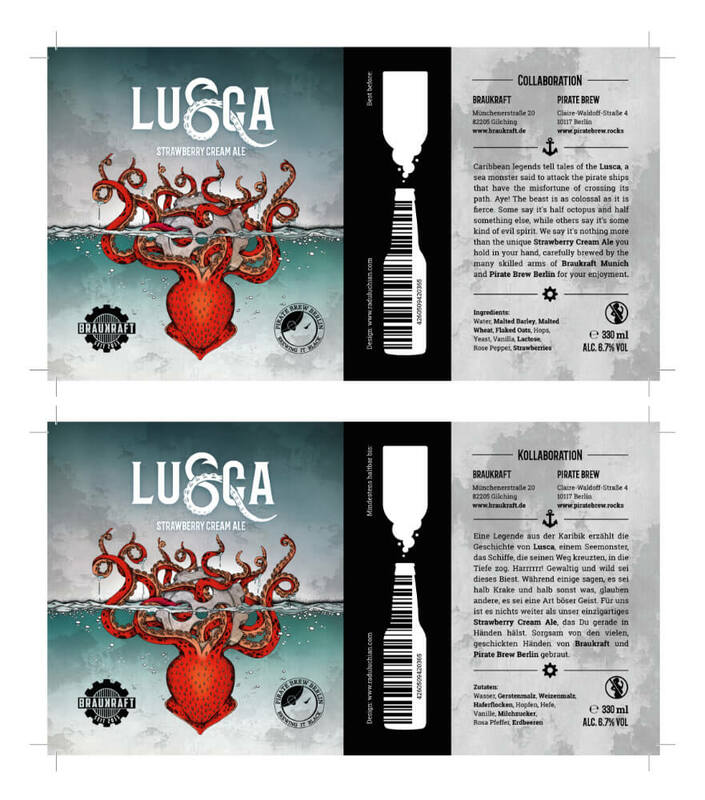 Once they signed off on the “Lusca” pitch I became fully immersed in taking this design from rough graphite on paper to fine printed labels on bottles. 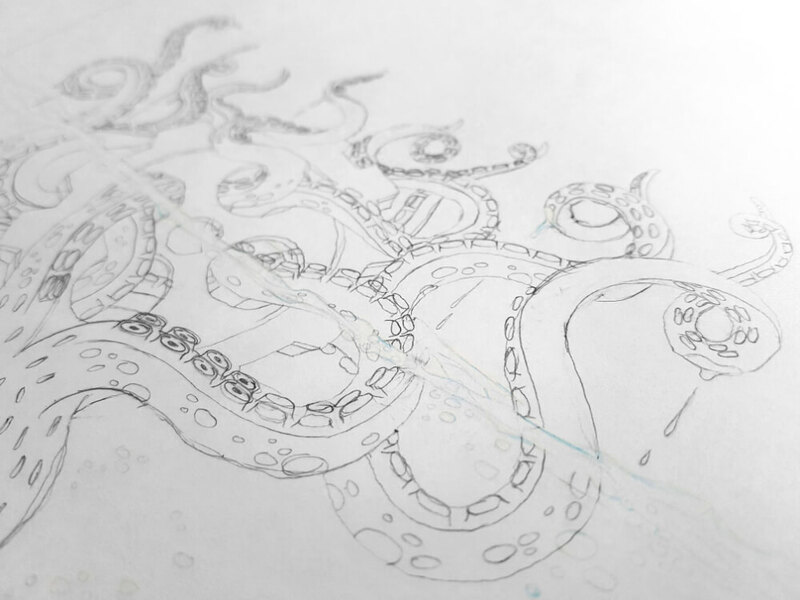 From the moment I became inspired by this variation of a Kraken—the “Lusca”—I knew it was a great opportunity to finally use one of my older lettering projects I had done at some point in 2013. 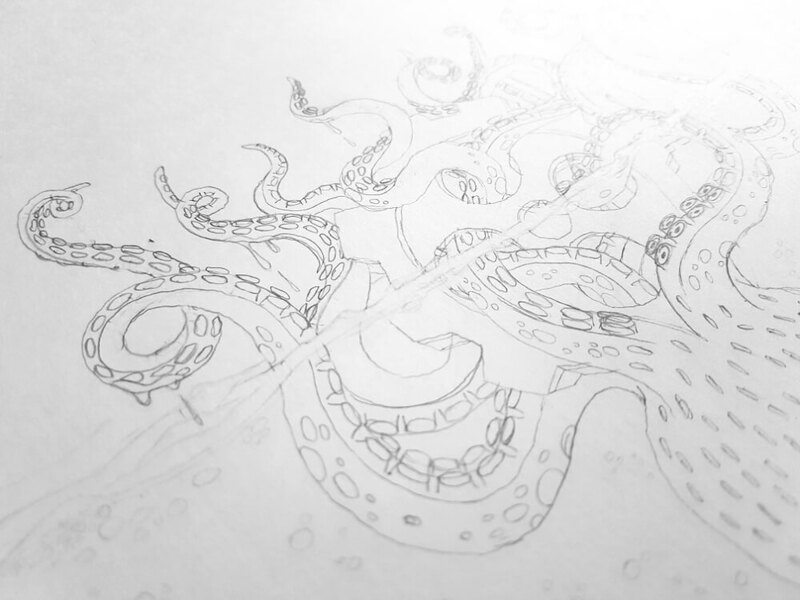 Back then I was playing around with a lettering project that revolved around the “squid” theme. I created a stylised “S” that on one end morphed into a hook and on the other into a sucker-filled tentacle, slipping its way through a circle to form the letter “Q”. 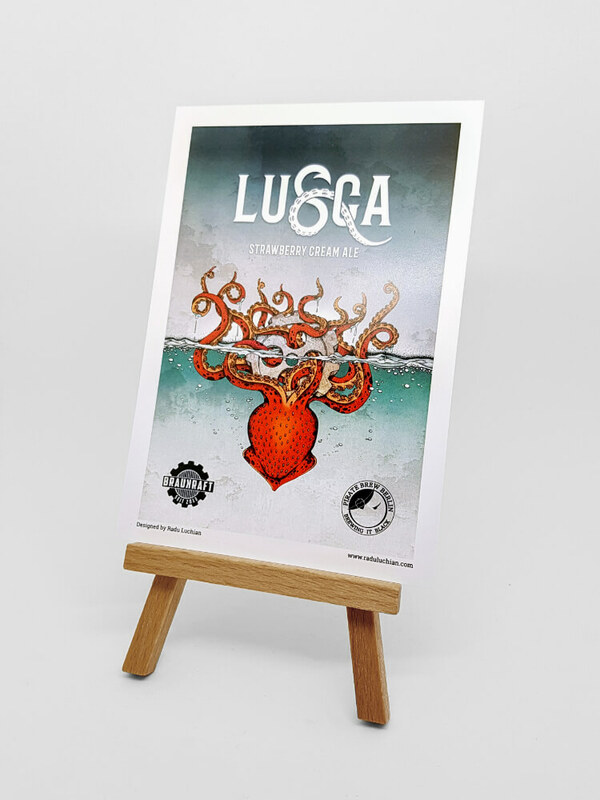 The word “Lusca” itself provided excellent symmetry for me to replace that middle “S” with my stylised version from that 5 year old project of mine. 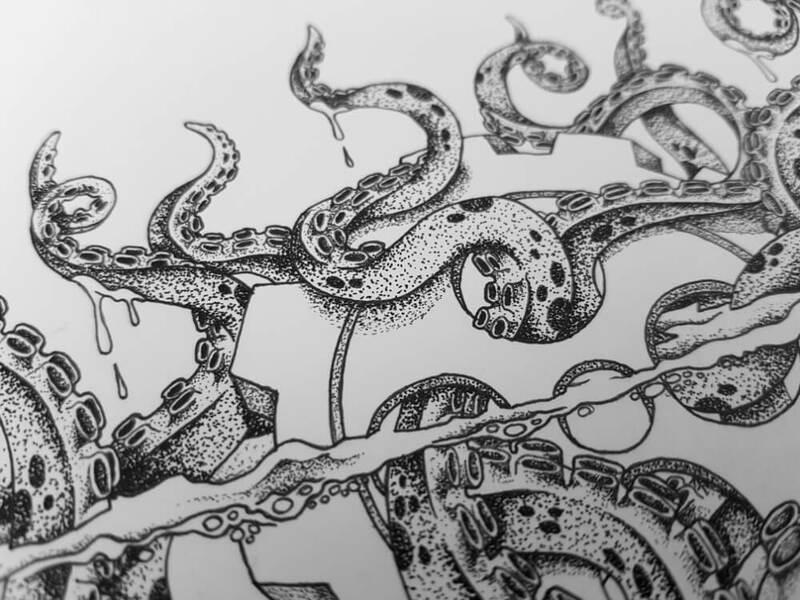 Back then I just wanted to experiment with lettering and only kept the “Squid” logotype in my archive in the hopes that one day it will make it back into the spotlight. How fortunate of me to have already thought of that so many years ago! 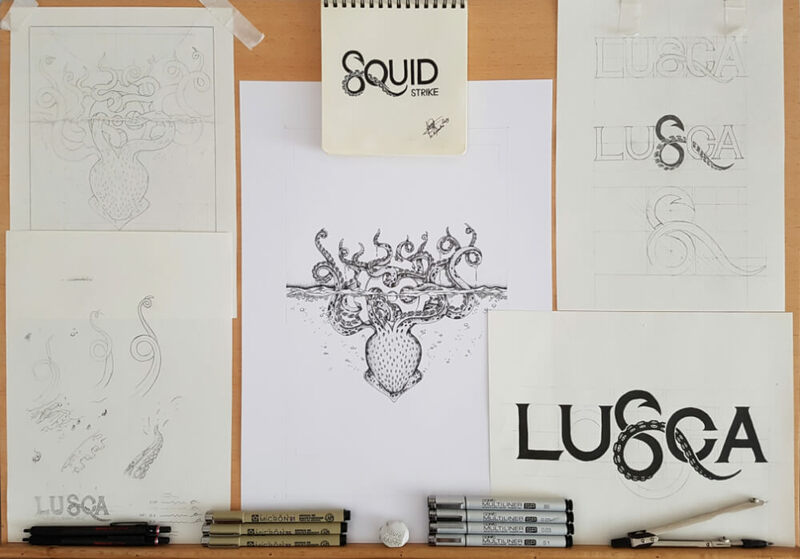 Although the concept was there, the typography itself and that squid-style “S” still needed to be refined and redone into something that would work well in a commercial product. Thankfully in the last years I’ve worked a bit more with typography and lettering—including my own Hopsylvania logo—enough that I was able to keep iterating and improving it up to a point that it became more balanced and consistent. Since I’m always more comfortable on paper than I am on digital, I went through a few versions of this before finally finding the right proportions that would play well with the rest of the illustration. I then went with Iván Núñez’s “Barbaro Roman” typeface for the rest of the letters because it had that heavy ruggedness I was looking for while still staying classy and narrow enough to fit on small 330ml beer bottles. 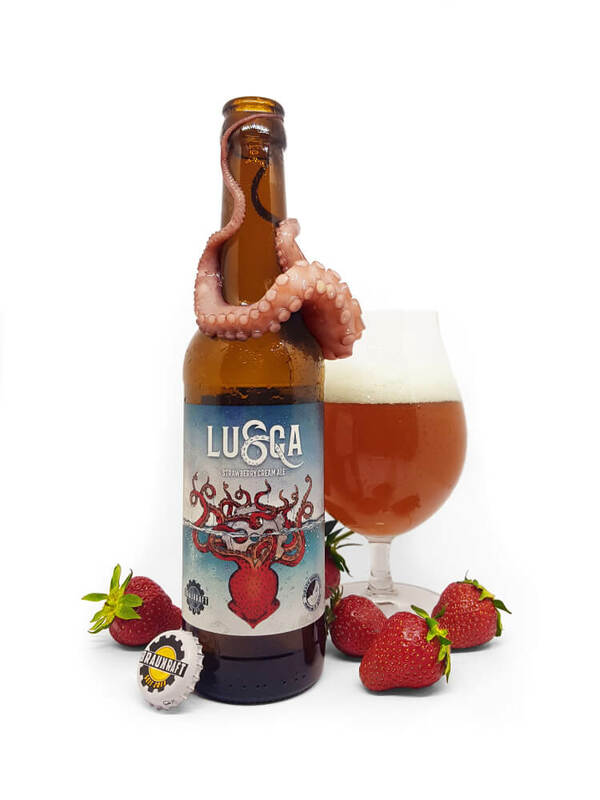 The fact that the “Lusca” is a hybrid creature enabled me to use a strawberry—the beer’s signature ingredient—as the core element, and then develop the rest of the monster around that. 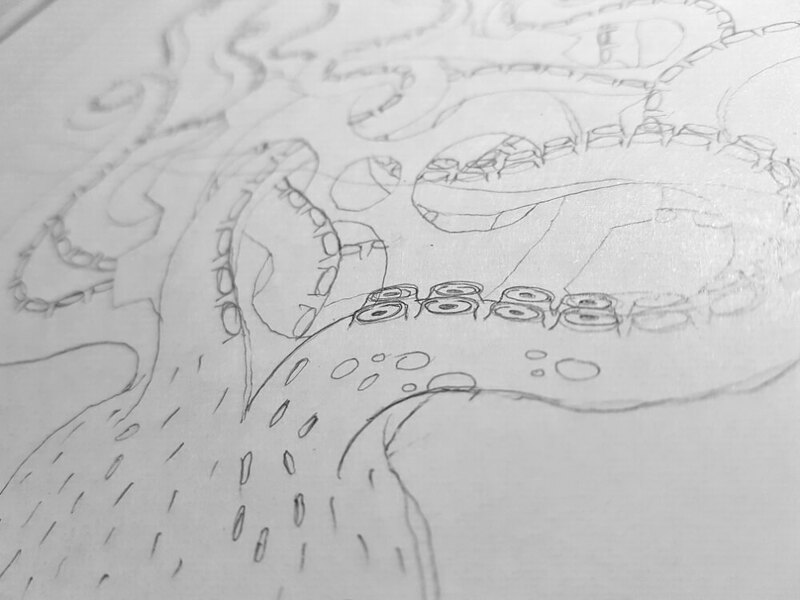 With squid-like fins on its sides and vibrant red color all over, I drew the eight long arms/tentacles and made them as entangled around the cogwheel as possible. 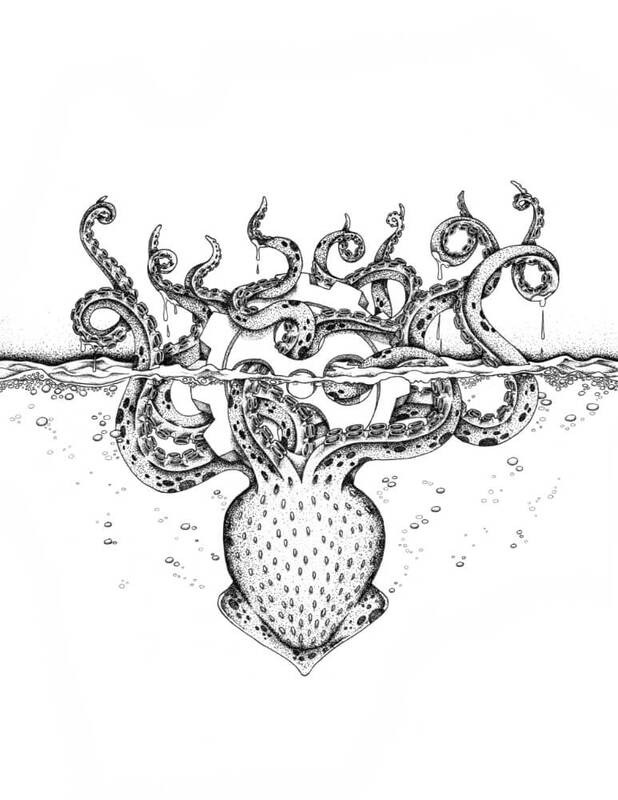 Moving together as a single organism, the tentacles in a way symbolize all the people from the two breweries that worked together as a team and put in the required effort of bringing this beer from conceptual idea to kegs and bottles. They are in the end the ones that do make the cogwheel turn. 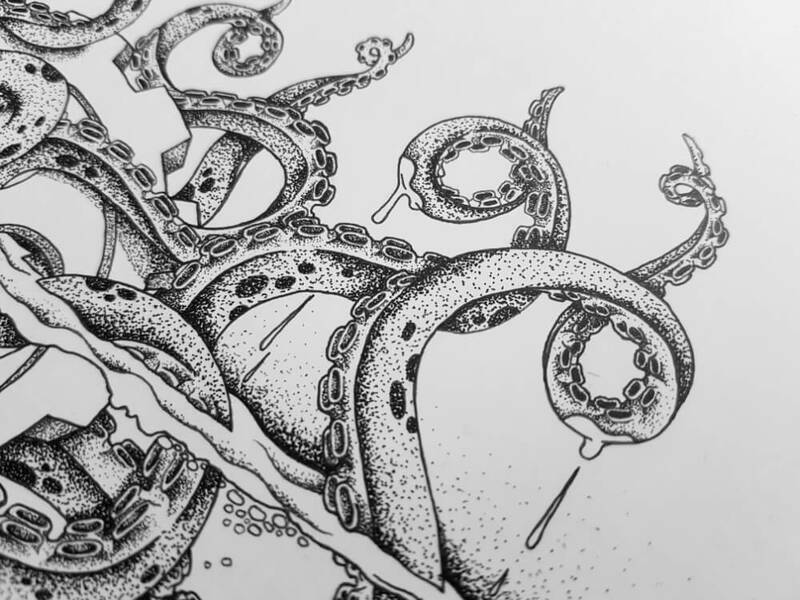 With the concept in place, it was time to get into details and bring this creature to life, and this meant giving it all of the details one would expect from such a beast: fluidity, slipperiness, strength and powerful suckers. 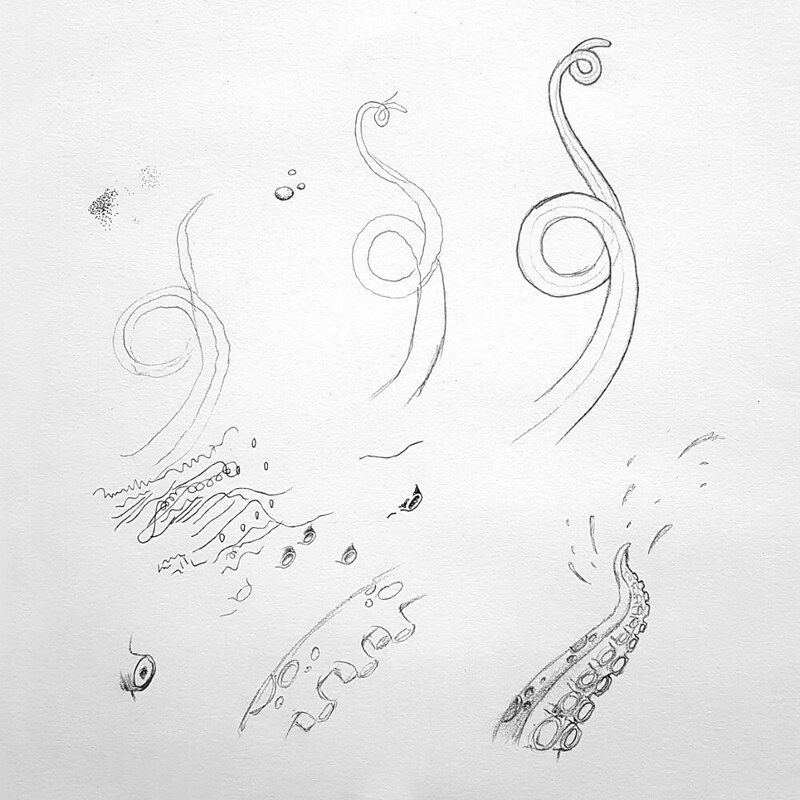 One of the very first things that needed to look more natural were of course its tentacles because, as seen above in my original pitch, they were at first more snake-like than octopus or squid. I therefore had to make them appear more lifelike, more twisted, each of them almost moving with a mind of its own… and this meant doing my homework. 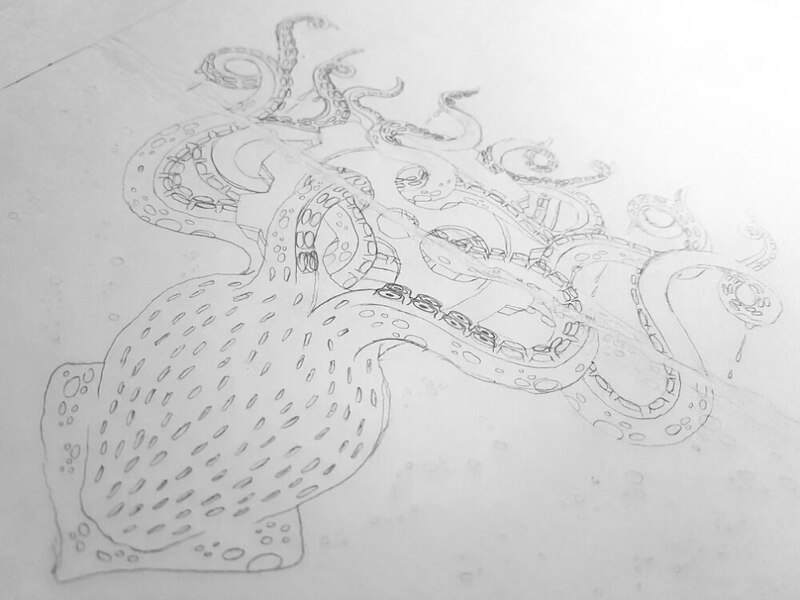 After having done extensive research into squid and octopus anatomy I ended up gathering quite the collection of photos, illustrations, stencils and tattoos that I could use as potential references. There was plenty of trial and error to get those twists to look violently natural, but once I had found the style I wanted it was just a matter of going through all of them and adjusting my previous pencil work. 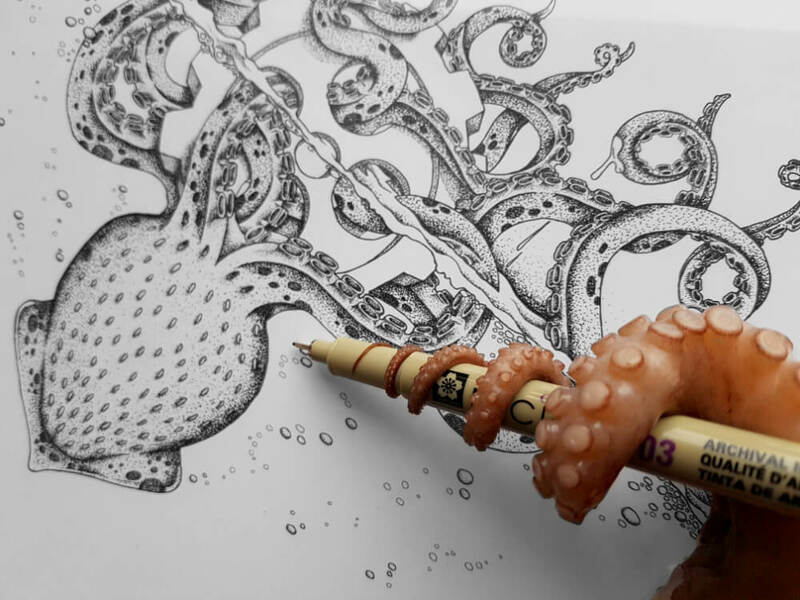 Once the motion and dynamics were as I had imagined them, I shifted my focus to the tentacle suckers, which were in fact almost as big a pain to draw as the feathers in my “Tender Surrender” illustration or the lilac flowers in my “Dazed & Confused” piece. One by one though I penciled them in to make sure that spacing and shapes are good and then I inked them in along with the rest of the drawing, cogwheel, body, water bubbles and all. This was actually the first of my illustrations in which I didn’t black out the background as I normally would, because the design had to stay fresh and bright. This made it a challenge for me to add that specific hint of darkness and macabre that I was so used to and that is so easily noticeable in the rest of my artwork. In the end though I do think that I managed to stay true to my style and deliver without compromising on the overall looks. As with my own label illustrations, I also spent many, many hours hunched over the drawing desk doting in the shadows for this piece. 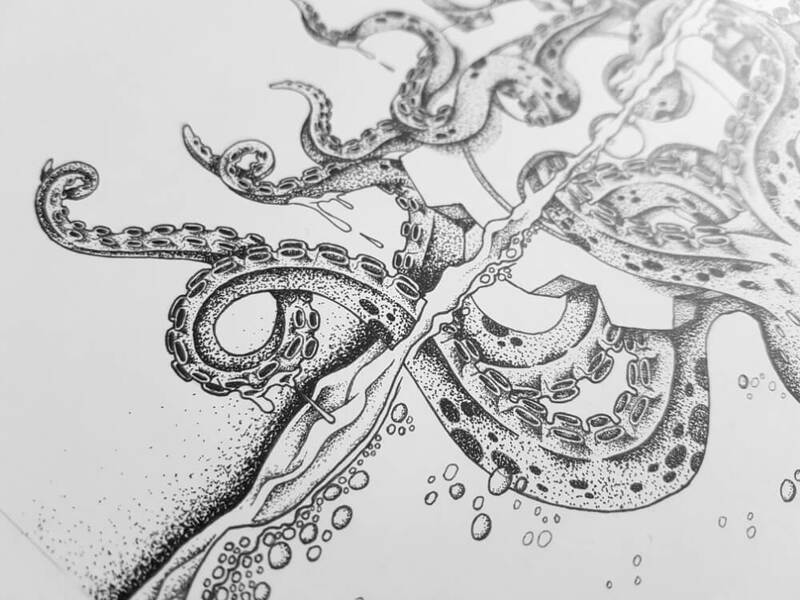 Similarly to all my other artwork, pointillism in fine ink markers was my go-to technique for adding depth to this illustration. Only when I was comfortable enough with the level of detail in it did I move ahead with the rest of my process of high-resolution scanning and then digitally coloring it. 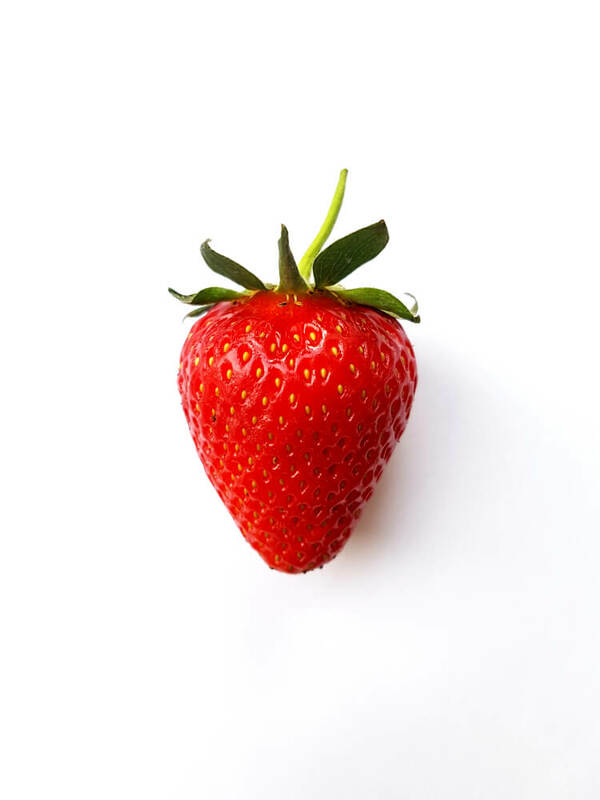 Vivid and lively, the strawberry “Lusca” now embodies complexity and ferociousness in a bright and intense package! With Braukraft being the host brewery, the labels had to remain to some extent consistent in layout with their old ones, while still having a certain uniqueness factor about them. 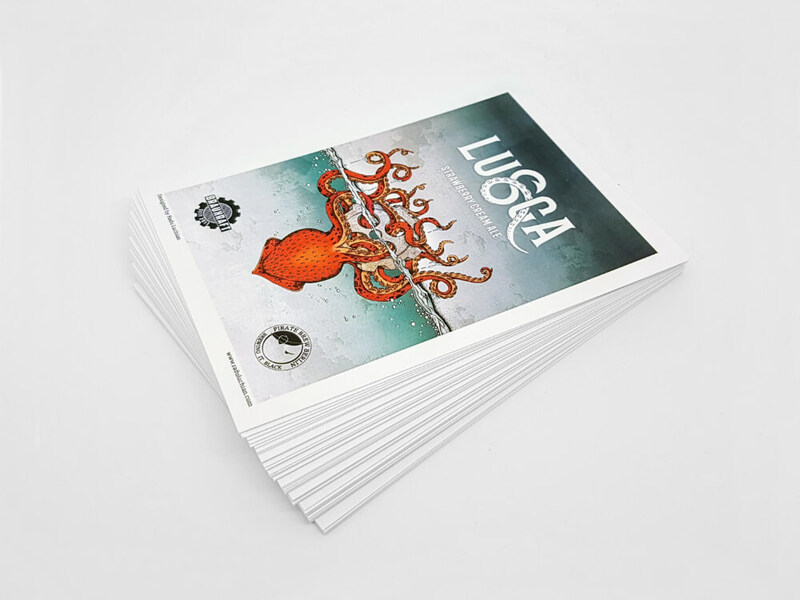 “Lusca” was intended to stir people’s curiosity. 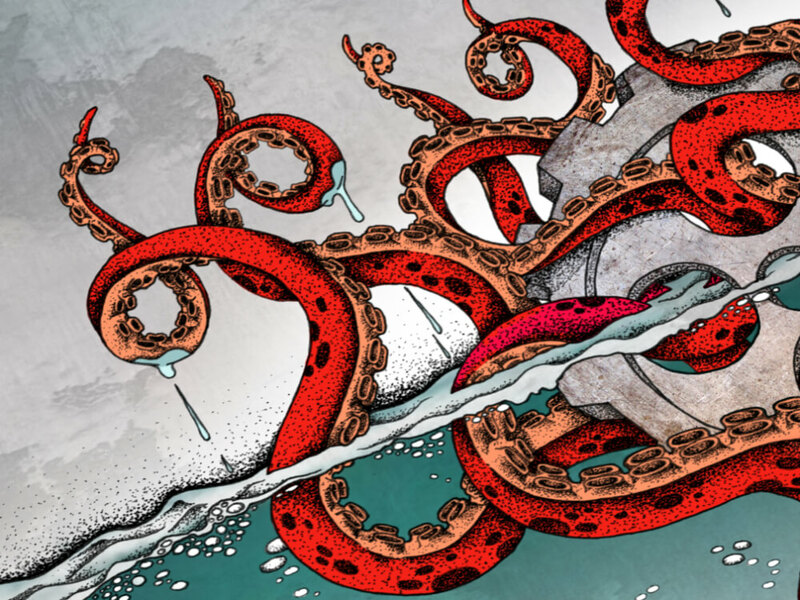 From packaging to bottle content, it was supposed to be a label that made you want to pick it off the shelf and check it out in its full detail, from the lively illustration on the front all the way to the intriguing tale of sea monsters and beer brewers on the back. Adding in small motifs from both breweries—such as the anchor and cogwheel—I took the liberty of also refining some elements from their older labels to bring them up to par with a more well organised and typographic content. Intended not only for German consumers but also for export, the label actually ended up being translated in English as well. This beer was going to be a big deal and by the time it even made it to the kegs, rumours had already started to spread around the two breweries’ inner circles, which made this a highly anticipated collaboration project. With the official launch happening at a very popular craft beer festival in Bavaria, it was the ideal moment to play the teaser campaign card. I therefore prepared a series of photos which the brewery could share over the course of 3 days leading to the festival. No hints, no description, just a series of hashtags and a lot of suspense. The goal was to build up enough hype that on the first day of the festival they would share the last picture and reveal the beer name and label, inviting craft beer lovers to come to their stands to try out the beer and get the full story behind it. Since the labels themselves were print-ready only days before the official launch, this meant that there was no way to have the beers bottled and labelled in time for the festival, so both breweries had to bring the beer over in kegs. This little packaging obstacle in fact turned out to be a good opportunity for them do some other kind of marketing, and so I printed out my artwork on heavy-weight paper postcards along with a few A3 matte paper posters that they could have on display at their festival stands for visitors and tasters to take with them. One thing I learned from this however was that for outdoor festivals one has to take into account windy conditions, in which case the easel and postcards would have to be fixed to the stand itself somehow. Overall though the postcard hand-outs were a real success at the festival and a great conversation starter on the artwork itself. This was one of the most intense projects I’ve worked on recently and it enabled me to not only collaborate with some very talented brewers but it also gave me interesting insights into an industry that I am very passionate about both as a designer and as a homebrewer. That’s not however the main reason for which I took this project on. What fuelled me through those small hours hunched over the drawing desk wasn’t just the thrill of designing a new label or having complete freedom over the artistic direction of this, no. As a beer lover myself, I think that people in general experience a beer—whether consciously or not—from the moment they lay eyes on it on the shelf up until that last sip that leaves them with an empty glass and a craving for more. Is there also a story behind that beer? Does it tell an interesting tale? Even better! This project allowed me to give this beer an identity that could help it have a fighting chance in a market where good packaging sells better than good beer, and “Lusca” now definitely delivers on both of these. Cheers and beers!